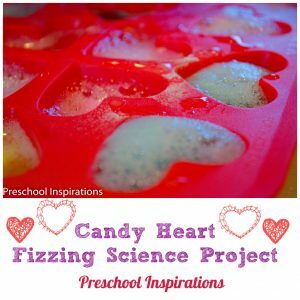 Do you need a child-made Valentine’s Day activity? Look no further! 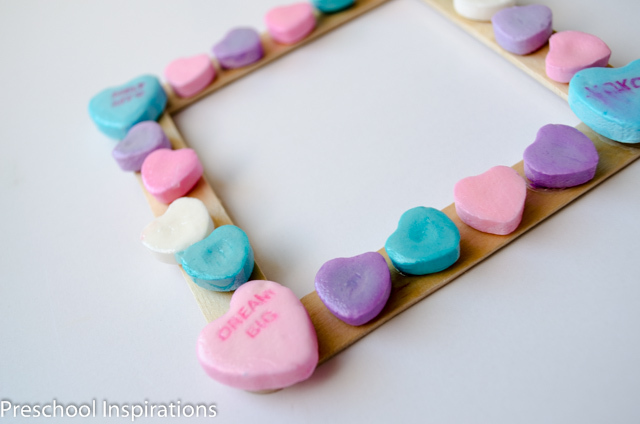 This conversation heart photo frame is by far my new favorite way to use those candy hearts that we get around the holiday of love! 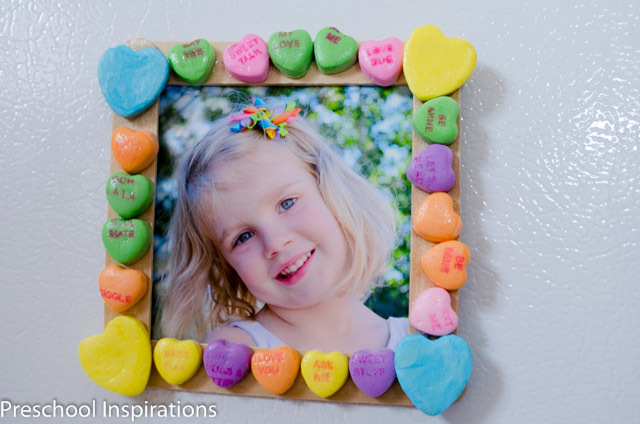 This conversation heart photo frame is an easy activity for children to do, and it’s a keepsake at the same time. 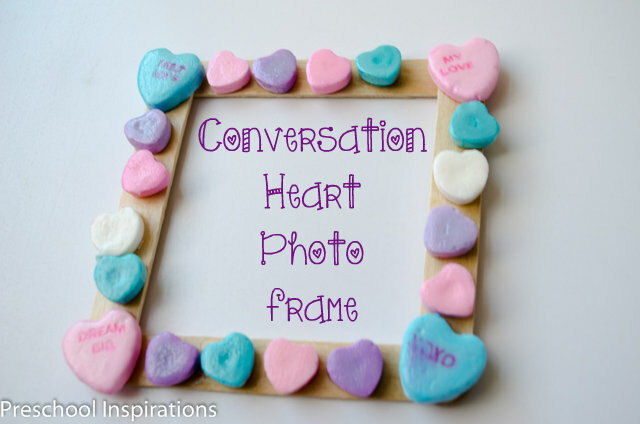 The glossy look of the conversation hearts is my second favorite part…second of course to the adorable photos of the children. They will always trump the cuteness award, right!?! I’m pretty sure you can’t go wrong with this (unless you don’t cover your table to protect it!) — all of these turned out just perfectly. 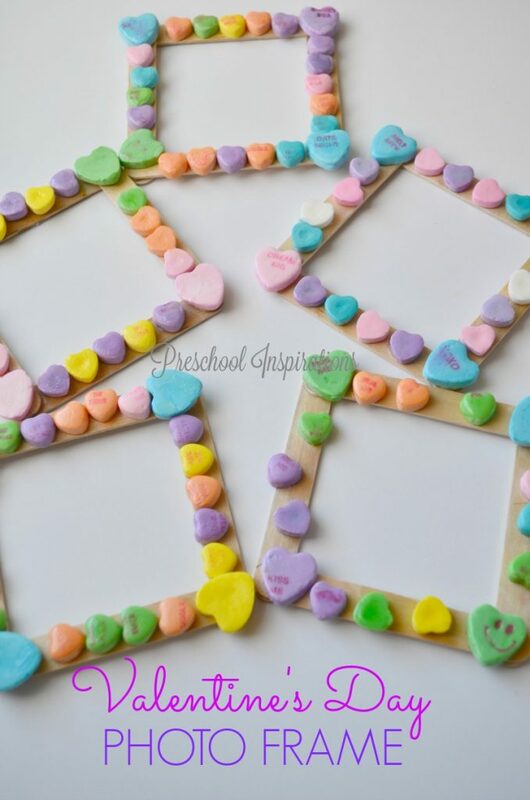 I do advise that you make this with children who are old enough not to eat candy hearts covered in glue. I imagine they would taste horribly bad, but that might not occur to a child until it’s too late! We ate some cracked and chipped hearts before starting so I could tame the temptation during the project. 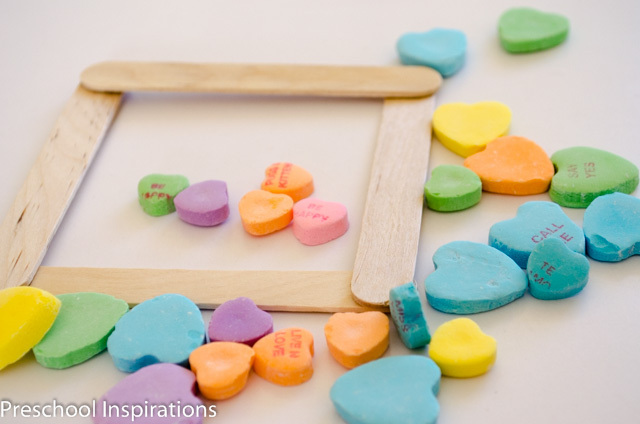 Here’s a glimpse of our conversation heart picture frame gallery. I went ahead and glued the four jumbo craft sticks together with hot glue, although some children could certainly help with this with a low temp mini glue gun . Then I put some watered down Mod Podge (about 50/50 to make it super easy to spread and tame the smell) on a paper plate. They “painted” the craft sticks with our cheap paintbrushes and watered down glue. Make sure to put a protective cover on the table because this glue is not easy to take off. Believe me, I’m speaking from experience here! I had the children do this in a well-ventilated area since Mod Podge can overwhelm a room pretty quickly. Then we added the fun conversation hearts. After the glue had settled for several minutes and the hearts were staying in place pretty well, they painted over the conversation hearts with more Mod Podge to get the shiny, glossy gorgeous look. It dries this way even! Just toss the paper plate when finished and wash the paint brush out right away or else you will have to toss that too. If any of the hearts fall off afterward, just glue them back on. I used super glue for the ones that tried to run away, although I’m sure that was probably overkill. Most of them stayed on though because this was one of those activities where I encouraged them to use plenty of glue… and then some. Lastly, add a super sweet picture and then attach some magnets or some string on the back to display it. Ours is on our refrigerator. It absolutely warms my heart every time I see it too! 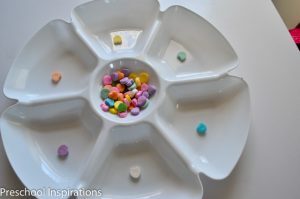 Are you looking for more conversation heart ideas? Try these! These are perfect! We were looking for something that the kids can make for their parents this week and I found it! Thanks for sharing. 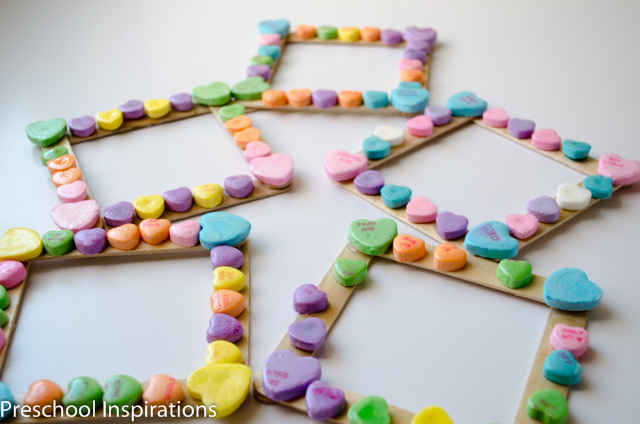 This looks like a great project to improve fine motor skills too! Do you think white school glue would work for this project? I would definitely test out the white school glue beforehand. Modge Podge holds so much better and gives that really nice sheen, so that’s why I chose it. Worst case scenario, you could always super glue on the conversation hearts if any fall off and still make it the way the child intended. I hope this helps :).